Plate locations are marked with chalk. Object. A dozen plastic dinner plates were positioned throughout the parking lot, including several locations in corners or along curbs that required the driver to back up or otherwise maneuver the car. The object was for the passenger to collect each plate and return to the finish line in the least amount of time. There is no prescribed route, so the team must plan an efficient order and angle of attack. There is also a “taking out the trash” mission for the driver that is explained below. The equalizer. In order to make the funkhana inviting to as many participants as possible, there should be a component where luck is a key factor. This equalizer intended to thwart the success of the fastest car or most athletic team, thereby giving just about anyone a chance to finish with a good score. 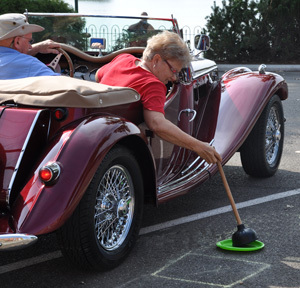 “Taking out the trash” required the driver to successfully toss a bottle cap into a small waste can after stopping the car no closer than an established chalk line. Only one cap could be thrown at a time and once the funkhana-meisters recognized the difficulty in throwing from a seated position, it was decided that after making 10 failed tosses, the car could proceed. Limited space. This Honey-Do Funkhana was part of the 2011 Fall GOF (Gathering of the Faithful), conducted by the Ohio Chapter of the New England MG-T Register at the Lafayette Hotel in Marietta, Ohio. The parking lot reserved for the club offered a superb panoramic view of the Ohio River, but was about half the size of a preferred funkhana venue. 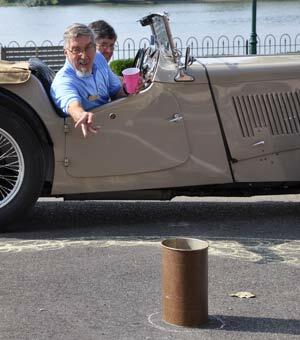 Plus, its 50-foot width challenged the large turning radius of the MG-TCs in attendance. The start-stop, back-and-forth driving required for dinner plate activity was perfect for the small parking lot, which is shown below. On the morning of the funkhana, cars were moved to the opposite end of the lot and much to everyone’s surprise, the funkhana took place in this area measuring only 50 x 100 feet! The plunger/plate challenge was perfect for this 50′ x 100′ area (without parked cars).